Freeze extra lime or lemon juice to use later. In medium saucepan with lid, bring 3 cups water to a boil. Add 1 cup barley and return to boil. Reduce heat to low, cover, and cook 45 - 60 minutes or until barley is tender and liquid is absorbed. Makes about 3 to 3 1/2 cups. Place any extra cooked barley in an airtight container and refrigerate for up to a week or freeze. Add cooked barley to soups, stews, casseroles and salads for a healthful fiber boost. Mix barley with remaining ingredients, except garnish, in a large bowl. Cover and chill several hours or overnight to allow flavors to blend. Garnish with cilantro or parsley sprigs, if desired, and serve. 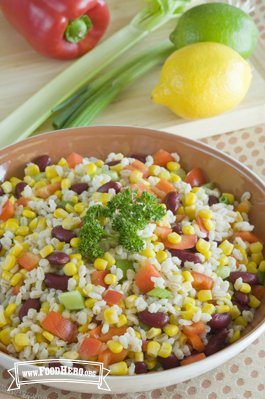 3 Comments for "Barley, Bean and Corn Salad"
This is a great salad. I usually have brown rice on hand so I have used that in place of the barley and it works great. Adding avocado and radishes gives this salad more even more color and flavor. I like to double the recipe so I have leftovers to pack for lunch for at least a couple days. I love grain-based salads like this! We often double or triple the recipe and then take it for lunch throughout the week. My family likes to make big batches of food on Sunday night and package them into little leftover containers so they are easy to grab and go in the morning. Yummy!!! We used black beans which gave great color. And orange juice for the juice. We didnt have cilantro or parsley so left that out. It was great right away to eat, and the flavors did get even better the next day. Served it with the Food Hero Fish and Spinach Bake which was the perfect match!